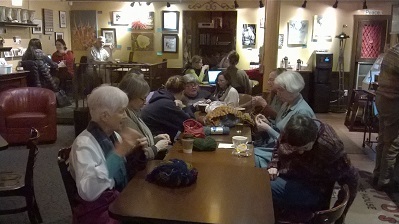 Who we are: people who have never knit before, people who haven’t knit in a long time, and people who are knitting pros! We are happy to teach you to knit or work on a new pattern, and it’s okay if there are mistakes – they’re just as warm and it shows some sincerity. Come enjoy the opportunity to create and keep others warm through the winter. Bring knitting needles size 9 or 10 and extra yarn to share if you have some – but don’t buy any because we have a stash! When we meet: Third Tuesday of every month, 7pm – 9pm at The Dane, 8000 – 15th Ave, in Ballard, of course! Who we donate to: Nyer Urness House, Cheryl Chow Court, the Bridge Care Center, and the Ballard Urban Rest Stop.